Frans van Houten, CEO of Royal Philips, discusses the opportunities, challenges and barriers involved in data driven innovation in the digital era. Focusing on emerging trends in the healthcare business, he explains how – by unlocking the power of big data – connected health systems can deliver personalized and industrialized care models that promise to herald a new era of outcome-based healthcare. 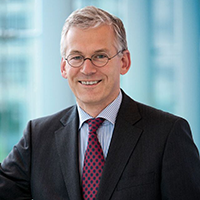 Frans van Houten is CEO and Chairman of the Executive Committee and the Board of Management of Royal Philips, a position he has held since 2011. His team is leading the company into the next decisive phase of its transformation to establish Philips as a healthcare leader. Having recently completed the separation from Philips Lighting, floating the company on the Euronext stock exchange, Royal Philips is uniquely positioned to reshape and optimize global healthcare though the transition to connected health, unlocking value from big data to pioneer population health management and personalized healthcare solutions in healthy living, prevention, diagnosis, minimally invasive treatments and home care.